You are such a nice cat Storm that you didn't kill the toad and your Dad could rescue it. He got bored with the toad after batting it. A few seconds after I took this, he rolled over on it and forgot about it! 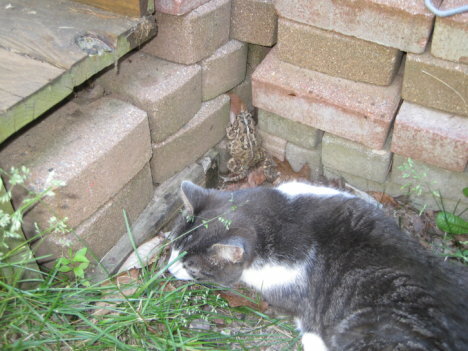 I had to rescue it from under him, and it squeezed it's way thru the bricks to safety back under the deck. True Viking Kitten moment! What's he looking at instead of that frog in the corner? ?